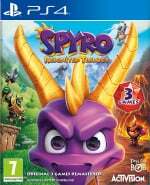 How do you win all the boss fights in Spyro 2 in Spyro: Reignited Trilogy? There may only be a few, but it's possible you may be struggling against one of the tougher opponents. Ripto's Rage! (or Gateway to Glimmer as it's called in Europe) introduces more traditional bosses; rather than implementing them in regular levels, each boss fight takes place in a bespoke stage. Let's go through them all below. Below is a list of each Spyro 2 boss and a description of how their fights pan out. If you want to be prepared ahead of each boss encounter, take a look at our rundown. Crush is the first boss in Spyro 2, and he's no pushover. He'll start the fight by standing on a blue pad and jumping to cause shockwaves. Jump over these and make your way to Crush. Once his shield is down, give him a flame attack and then charge away to avoid his club. Some rocks will fall on him, causing some damage. After this happens twice, the pads on the floor will turn red and Crush will attack you with energy beams. Avoid these and get close enough to flame him again. Repeat this until he has only three hit points left, at which point the pads become red and blue, and Crush will unleash three attacks simultaneously. Keep flaming him until he begins to chase you. Run away and eventually he'll attack with his club once more. Dodge it, and he'll finally be, er, crushed by falling rocks. You win! In the latter half of the stage 'Scorch', you'll come across a challenge in which you need to retrieve some flags for a character named Handel. Once you've spoken to her, grab the Superflame power-up and charge back out of this area across the bridge. Head through the next area and climb the platforms to the right, and take aim at Bombo atop the building. Shoot him down and speak to him, then chase him back to where Handel is while dodging his bombs. You'll need to repeat this process twice more, but Bombo will appear in different locations each time, so be sure to take note of where the flags are in the level. Gulp is another large boss like Crush that you'll find in the stage Gulp's Overlook. In this fight, you'll need to avoid his body slam attacks and wait for Elora's pterodactyls to drop some eggs containing a variety of items. Use these to fight back against Gulp and deal some damage. Charge barrels towards him, flame bombs to light them, and shoot the rockets from Spyro's mouth. Chickens will also occasionally appear, which will give you some health back. Not long into the fight, Gulp will also start making use of these items in an attempt to stop you. He'll even get health back from the chickens, so try to beat him to these if you don't want the fight to go on for too long. Keep on using the items dropped into the arena while dodging Gulp's various attacks to defeat him. One of the challenges in the Metropolis stage sees you fighting an aggressive Ox at the end of an icy area. While you're on the slippery surface, the creature will fire bombs to the left, middle, or right. The objective here is to fire the bombs back with Spyro's flame breath, but that's easier said than done while sliding about on the ice. This can be a little tricky, but the Ox will repeat a pattern of where he shoots the bombs, so it's fairly predictable. Fire enough bombs back at him and he'll be a goner. And here we are at the final boss of the game: the titular Ripto. This guy may be small, but he's no pushover. When the fight begins, you'll have to charge about and dodge his attacks while you wait for Hunter to fly over and drop in some power orbs. 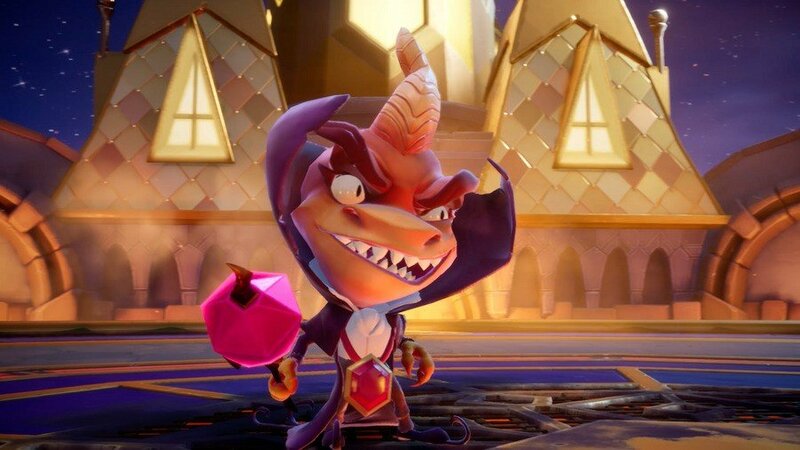 The catch is that these orbs will provide both you and Ripto with powerful abilities, so you'll want to collect them as quickly as you can. Gathering three will give you a souped up attack you can use to deal some damage to Ripto. You can prevent him from getting the orbs instead by blasting him with fire or charging into him -- this will send him back a little bit. Once you've advanced far enough into the fight, Ripto will summon a robotic version of Gulp. Riding on its back, he'll continue to fire shots at you while Gulp will swallow up the orbs. You'll need to carry on collecting the orbs and attacking the robo-Gulp when you can. Eventually you'll deplete its health bar, and it'll explode. The final phase of the fight sees Spyro and Ripto take to the air. Fly after Ripto and his giant bird and shoot some fireballs at him, but be careful to avoid his attacks -- he'll be taking potshots at you too. Your best bet is to shoot a little ahead of Ripto while he's moving so that your attack lands as he passes by. Once you've brought his health to zero, you'll have beaten him, bringing peace to Avalar. Nice going!